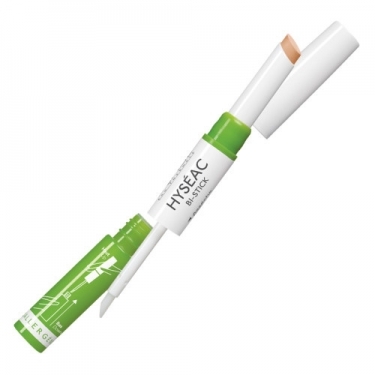 DESCRIPTION: Hyséac Bi-Stick Stick Anti-Imperfections from Uriage is a stick anti imperfections. Simple and easy to use, is a care with two complementary actions. Alcoholic hydra lotion enriched with keratolytic agents and anti seborrheic dry imperfections and stick concealer with color, disguises imperfections and has soothing and purifying due to TLR-Regul complex action. It can be used before or after makeup. Hypoallergenic. Non-comedogenic and fragrance. -42% decrease in the size of imperfections within 7 days. * * Study carried out under dermatological control on 22 subjects. Apply the lotion in the imperfection and let dry a few seconds, then apply the stick in imperfection and blurring. Renew with little touches to 4 times a day. It can be used before or after makeup. Renew with little touches to 4 times a day. It can be used before or after makeup.